Kyiv, September 2016. Canyon Central team has held two annual meetings of Marketing and Sales representatives. The first meeting took place on 5-6 of September for the representatives (PLSM) of Eastern European countries (Romania, Bulgaria, Serbia, Croatia, Czech Republic, Slovakia) and the UK. The second meeting took place on 15-16 of September for CIS countries. The participants discussed the achievements of Canyon brand in 2015-2016, reviewed new products and approved a strategy for the next year. The major accomplishments of Canyon brand in all the mentioned countries are: successful sales of computer mice (over 1 million items sold in one year period) and keyboards (more sales had been made in the last 8 months than in 2013 and 2014 in total), as well as reaching 15% Power Banks market share in Russian Federation. Another achievement of the brand is an ambitious launch of Canyon NRG, a new product line of alkaline batteries. A part of Canyon strategy for the upcoming year is upgrowth of such categories as headphones and headsets, PC-accessories (mice) and power banks. Also, Canyon Team will be focused on the brand of LED lamps Canyon LED due to the significant rise of this product segment in each country. But the main novelty for the nearest time will be the launch of a new sub-brand Canyon Smart, a full range of products and solutions for Smart Home. The details are to follow. conducts the sales training for PLSM. 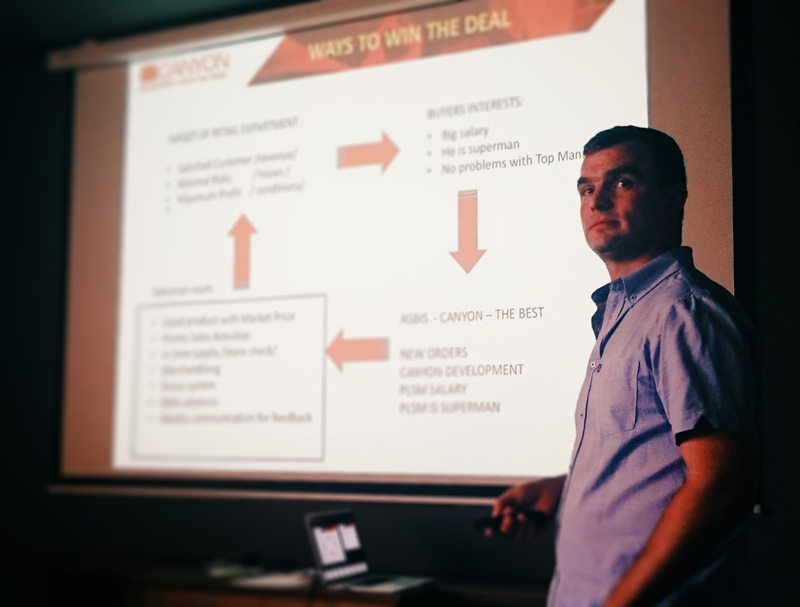 Also, the participants of the event took trainings in sales and product presentations, discussed current digital trends and the ways of their implementation in Canyon marketing strategy. In response to new challenges of the market, Canyon team continues to develop the brand by offering consumers high-quality products at affordable prices.